Istanbul has always been a popular tourist destination, fulfilling the traveller's wish to journey back in time to a truly ancient city with a rich and fascinating heritage. Straddling both East and West, Asia and Europe, the city has been a prized location for many settlers, both violent and peaceful... and the architecture of mosques, temples, bazaars, cobbled streets and of course the wide Bosphorus "river" lay testament to this past. However Turkey is now hauling itself into the 21st century and Istanbul is truly one of the world's most exciting modern cities, for both business and pleasure, and for the traveller who now seeks present day excitement as well as millennia-old sights. The proliferation of cranes on the skyline demonstrates this perfectly...already several shiny new tower blocks have popped up that you feel were probably not there five years ago. Raised up on a hill on the European side of the city is the brand new Zorlu centre; an extremely high-end complex of shops (only top-end international mega-brands), restaurants (we were stunned to find a Jamie Oliver's Italian! ), a performance centre, private residences, and hotels. 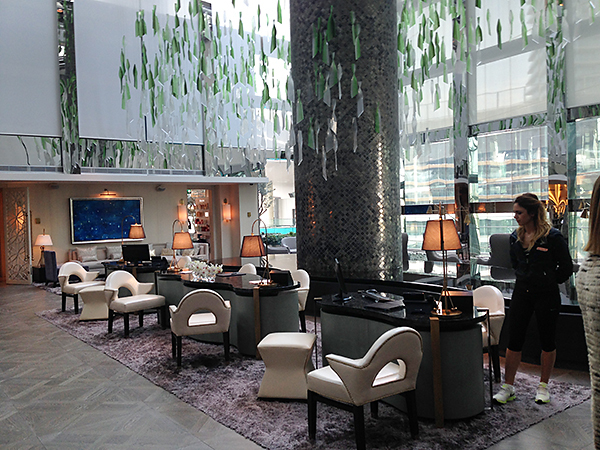 And with impeccable timing, international hotel groupRaffles has sensed the growing demand for luxury in the new Istanbul and with canny judgement, decided to set up shop (as it were) in the Zorlu centre. This makes sense, as the heart of the city is still a wonderfully noisy, busy, slightly shabby, hubbub and the Zorlu's detachment from this must surely appeal to the mega-rich customers it is hoping to attract. Indeed, there is a heated helipad on the roof to facilitate arrivals and departures for those unwilling to brave Istanbul's notoriously chaotic roads! Not being quite in that league, we took a cab from the airport, and in 50 minutes were deposited at Raffles' front door, to be greeted by several courteous staff. The reception area (above) makes a great first impression: cavernous, opulent, high-impact. A gorgeous rose-like fragrance hangs in the air, there are huge vases of orchids on most surfaces, one gets a sense of old Turkey being given a luxurious, modern twist. Whisked up to our suite by our very own assigned butler, the magic intensified, as we stepped into one of the hotel's prime suites: situated on a corner of the modern block that is Raffles Istanbul. Needless to say the three main rooms (living area, bedroom and bathroom) were beautifully and tastefully appointed (see above), in the old-Turkey-meets-the-Modern-World style established downstairs, but the gasp-factor was provided by the floor to ceiling windows in these areas, which offered a breathtaking panoramic view of the city and river. And on top of that, the enormous private L-shaped terrace that hugged the suite (see below), could truly be considered an extra room in warmer weather (we stayed in a slightly chilly January). ...and the bathroom...I LOVED lying in that bath with Istanbul-by-night glittering below me! And for when you fancy an alternative to the cityscape, the TV-in-the-mirror is an entertaining/useful diversion. What about the rest of the hotel? On our first night we dined at the excellent Rocca restaurant (below), which specialises in contemporary Turkish cuisine (I had a delicious lamb tartare for my main course). And, being hitherto totally unaware of Turkish wines, we decided to only drink them during our stay and had a lovely rosé with the meal at Rocca. There is also a rooftop swimming pool that turns into a live-music and a DJ/club area at night. Raffles Istanbul boasts two cool bars; the Long Bar (see below), and our favourite: the Writers Bar (dedicated to the many famous authors who have stayed at Raffles' original hotel in Singapore). The cocktails were amazing (I had one based around Turkish spices and pomegranate) and served with the now-customary exquisite polite friendliness. We were shown around (but didn't have time to use, sadly) the hotel's spa and wellness centre (see pics below), a 3,000 sq metre sanctuary from the world that felt calm and luxurious. There are three Turkish hamams, saunas, steam rooms, massage rooms, a gym, indoor pool, yoga and pilates studio and hair/manicure salons. For one of our nights out in the city, we decided to test out the hotel's concierge service. We picked a restaurant (Neolokal) in the city's ultra-cool Karakoy district that had been described by Time Out Istanbul magazine as very cool and buzzy. Would the guy behind the desk be able to book us a table literally half an hour before we intended to turn up? Yes, of course he would..and he did, and booked us the cab to get there. Impressed! This level of friendly, attentive service permeated our stay at Raffles. When we accidentally pressed the "Privacy" button by the door to our room and then left for the day, we returned to find a hand-written note from the housekeeping staff had been slid under the door to check that all was well. And a quick call to our butler ("Good evening Mr Newton!" before I had spoken) sorted it out in minutes. That's what differentiates superb hotels from merely good ones. Long may Raffles reign!